Our extension can help you to remove product reviews and ratings feature in your Magento 2 store. It handles all possible places: product page, category page, customer account area and product list widget. 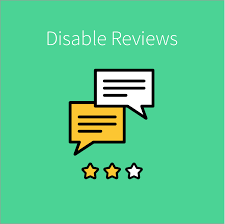 This module allows disabling of reviews and ratings in Magento 2 store. Supports both Magento Community (Magento Open Source) and Enterprise Edition (Magento Commerce) versions. Unpack the archive. You will be able to find src directory in the root folder. Copy contents of the src directory to the root directory of your Magento installation. Then clear the cache . Go to admin page under System → Cache Management and press Flush Magento Cache button. Now the module is enabled in the system and it is ready to be configured and used. In Magento admin navigate to Stores → Configuration → Catalog → Catalog → Product Reviews → Disable Reviews . By default, this setting is turned off. In order to remove reviews and ratings switch this setting to Yes and clear the cache. It is possible to change settings on different levels (default/website/store).